A new technique which uses light like a needle to thread long chains of particles could help bring sci-fi concepts such as cloaking devices one step closer to reality. A new method of building materials using light, developed by researchers at the University of Cambridge, could one day enable technologies that are often considered the realm of science fiction, such as invisibility cloaks and cloaking devices. Although cloaked starships won’t be a reality for quite some time, the technique which researchers have developed for constructing materials with building blocks a few billionths of a metre across can be used to control the way that light flies through them, and works on large chunks all at once. Details are published today (28 July) in the journal Nature Communications. The key to any sort of ‘invisibility’ effect lies in the way light interacts with a material. When light hits a surface, it is either absorbed or reflected, which is what enables us to see objects. 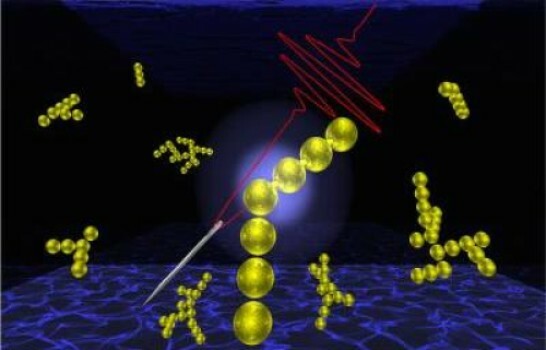 However, by engineering materials at the nanoscale, it is possible to produce ‘metamaterials’: materials which can control the way in which light interacts with them. Light reflected by a metamaterial is refracted in the ‘wrong’ way, potentially rendering objects invisible, or making them appear as something else. Metamaterials have a wide range of potential applications, including sensing and improving military stealth technology. However, before cloaking devices can become reality on a larger scale, researchers must determine how to make the right materials at the nanoscale, and using light is now shown to be an enormous help in such nano-construction. The technique developed by the Cambridge team involves using unfocused laser light as billions of needles, stitching gold nanoparticles together into long strings, directly in water for the first time. These strings can then be stacked into layers one on top of the other, similar to Lego bricks. The method makes it possible to produce materials in much higher quantities than can be made through current techniques. In order to make the strings, the researchers first used barrel-shaped molecules called cucurbiturils (CBs). The CBs act like miniature spacers, enabling a very high degree of control over the spacing between the nanoparticles, locking them in place. The key to controlling the bridges lies in the cucurbiturils: the precise spacing between the nanoparticles allows much more control over the process. When the laser is focused on the strings of particles in their CB scaffolds, it produces plasmons: ripples of electrons at the surfaces of conducting metals. These skipping electrons concentrate the light energy on atoms at the surface and join them to form bridges between the nanoparticles. Using ultrafast lasers results in billions of these bridges forming in rapid succession, threading the nanoparticles into long strings, which can be monitored in real time.